Michael Stelzner delivers the opening keynote at Social Media Marketing World 2019. 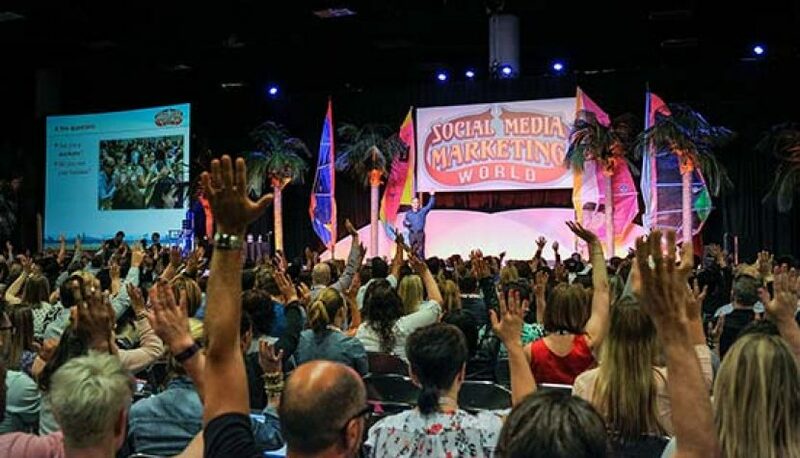 NewPoint team members are among the 6,000+ attendees in San Diego, CA, at the world’s leading social media conference–Social Media Marketing World. We’re attending workshops with experts on topics ranging from how to build better Facebook ad funnels to boost e-commerce sales, to using social media to enhance customer service, to how to use Google analytics insights to increase marketing ROI. Here are three insights into where social media marketing is heading in 2019 and beyond. Whenever Mark Zuckerberg makes a public announcement about big, mission-defining changes for Facebook, Michael Stelzner says that marketers better listen. The CEO and Founder of the Social Media Examiner, the organization that puts on Social Media Marketing World 2019, gave a brief history lesson on how all of Zuckerberg’s major announcements since 2007 portended huge changes on how brands, businesses and marketers would succeed in reaching audiences on the world’s most popular social platform. So what’s Zuckerberg’s latest major announcement? Last year Zuckerberg announced that Facebook would shift its focus to prioritize “meaningful social interactions.” With the goal of emphasizing well-being and personal connection, Zuckerberg admits that Facebook will downplay content from non-human-individual publishers on Facebook, like news orgs, businesses and brands. Given this development, Stelzner urged marketers to focus on making a big impact on a smaller number of people rather than trying to make a small impact on a big number of people. The former will reap results; the latter will largely get scrolled over. Two social media wizards known for creating entertaining social media content that stands out from the crowd, Andrew Pickering and Peter Gartland offered a new marketing principle to heed. Nearly everyone’s heard of the 80/20 rule that states that approximately 20% of your efforts will generate approximately 80% of your revenue. A variation of that, Andrew and Pete’s 90/10 rule invites marketers to NOT worry about doing everything: being on every social media platform, creating content in every format possible, blogging, tweeting, producing video, running contests and email campaigns, and so and so on. Spreading your marketing efforts too thin will produce a lot of content, but a lot of mostly mediocre and unremarkable content. Instead, Andrew and Pete’s 90/10 rule urges marketers to focus 90% of their energy on doing one thing really well, and allocating the remaining 10% to whatever else needs to be done. Doing one thing extraordinarily well will gain more attention–and a more loyal following–than creating a lot of uninspired marketing content. Often called the Queen of Facebook, Mari Smith all but declared the Facebook Newsfeed dead. The Newsfeed was once every marketer’s bread and butter– “our cheese,” as Smith called it. Content published for the Newsfeed offered an easy way to reach massive audiences and build a large brand following quickly. In recent months only offered severely throttled results, with most organic content only reaching 1-6% of a Facebook page’s following. Smith’s conclusions largely mirrored those of Michael Stelzner’s keynote the day before. Understanding how Facebook is looking to de-emphasize its Newsfeed in order to emphasize more personal connections, Smith encouraged marketers to turn to publishing more short video content, Facebook and Instagram’s “Stories” feature, private messenger marketing and building private groups around niche interests as a way to connect to highly engaged audiences. In turn, Facebook’s algorithms will reward those businesses and brands who generate reaction and discussion among their audience with increased reach. 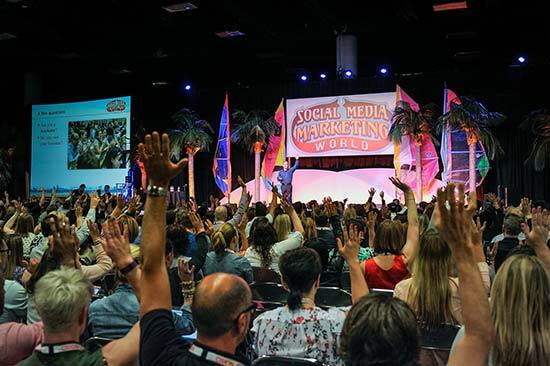 Stay tuned for more blogs on what we’ve learned from Social Media Marketing World 2019 in the future. If you have any questions or would like to learn more about this topic, please reach out to the NewPoint team. If you are interested in more food marketing topics, please visit our “Intel” page or check out NewPoint founder Patrick Nycz’s book: Moving Your Brand Up the Food Chain. Shelf Space and How to Get It: Good Food Expo 2019 Panel What makes a quality website?